Click on one of the small images to begin. This coat has been signed by the artist, Ai Weiwei, on the inside lining. 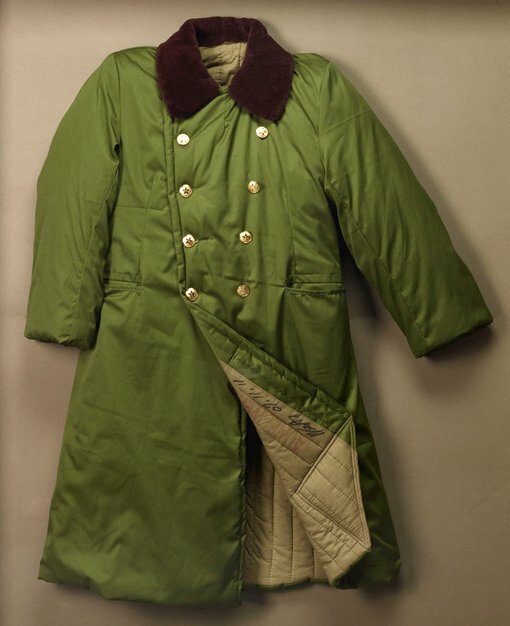 Khaki green and quilted, it evokes the cold Chinese winter against which it is designed to protect. Ai Weiwei has gifted many such coats to a charity for the homeless in China. As the artist says, ‘I gave them these military winter coats that were like a luxury good during the Revolution and after … I like the notion of giving my works away to people who don’t really care that they are art. They really care about the protection and warmth they get from my work’. Overcoat is a homage to the dada artist Marcel Duchamp who pioneered the found object as art. Ai Weiwei has previously fashioned a portrait of his idol from an old coat hanger. Can you see the influence of Marcel Duchamp in this work? How has Ai Weiwei reconceptualised Duchamp’s ideas? Develop a case study on the impact of the found object and its role in redefining art. Reference Duchamp and Ai Weiwei as well as others in the Go East exhibition to support your argument. This image is from a multimedia installation titled Erasure that brought together two distinct historical moments: the arrival of Europeans in Australia and the tragic 2010 sinking of a refugee ship in Australian waters near Christmas Island. Lê’s work often evokes his own experience of exile. He fled Vietnam in 1978 when the Khmer Rouge invaded his hometown near the border of Cambodia. He describes running with his family across a beach, while being shot at, to reach a boat that took them away from their homeland. Growing up in America, Lê wrestled with the various representations of Vietnam’s history. He began to question Hollywood portrayals of the war in Vietnam as an art student in California. By drawing upon his own experience as a refugee, Lê invites the viewer to imagine themselves as refugees on a boat. How does the bringing together of two distinct historical moments heighten the meaning of this work? How do the image’s political and social associations impact on the way you read this work? 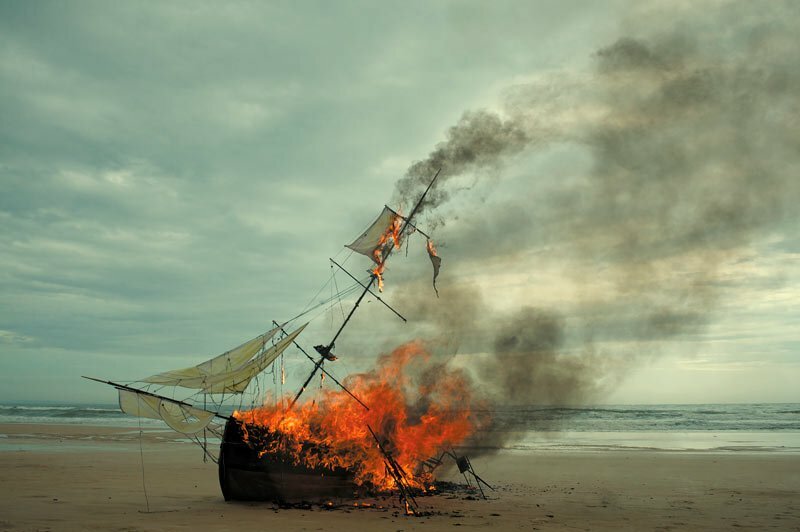 Imagine the sounds you would hear if you were near this burning ship. This artwork by Vietnamese artist Dinh Q Lê was influenced by a tragic refugee boat accident that happened in 2010. The image is a copy of the HMS Endeavour , the ship that carried the first Europeans to Australia. This artwork also has deep personal meaning for Lê as he fled war-torn Vietnam by boat with his family in 1978. They later settled in Los Angeles. Knowing a little of Lê’s story, does this change how you look at the ship? More culture is slowly smothering us and turning our faces black. It is impossible to take away your inborn blood and personality. From a shadow in the morning, then suddenly into the dark night, the first cry of life to a white-haired man, standing lonely in front of window, a last peek of the world and a remembrance of an illusory life. 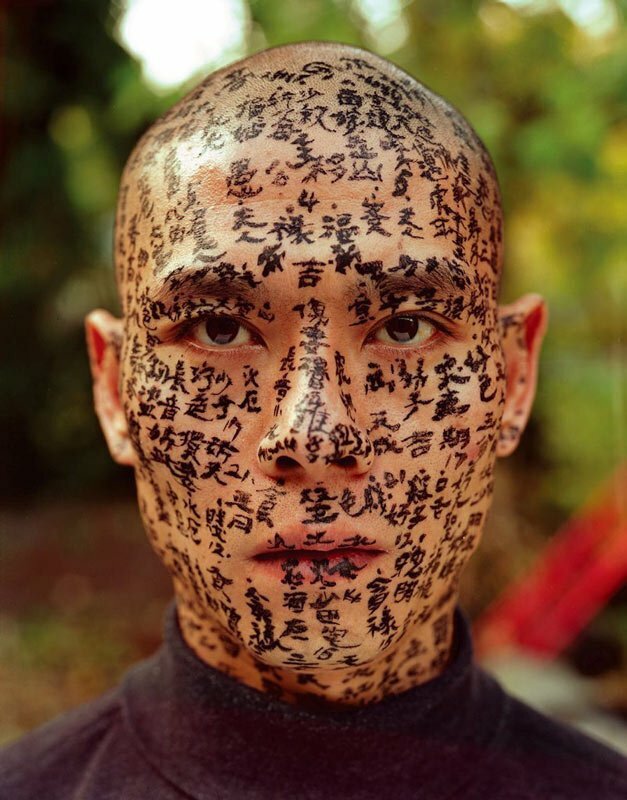 In this passage Chinese artist Zhang Huan speaks about his work Family tree , a series of large photographs in which he invited three calligraphers to write onto his face from morning until nightfall. Created during Zhang Huan’s period in New York, Family tree expresses the artist’s complex relationship to his then-estranged homeland. 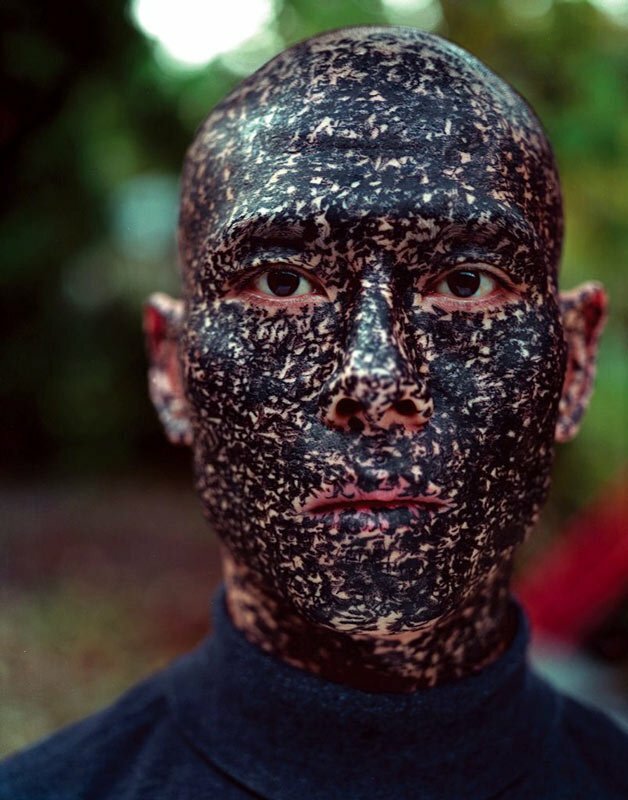 Zhang Huan believes that repetition and time can alter, and even eliminate, meaning, facts and associations, as evidenced in Family tree . Do you agree with his point of view? Can you think of other artists who have explored this idea? 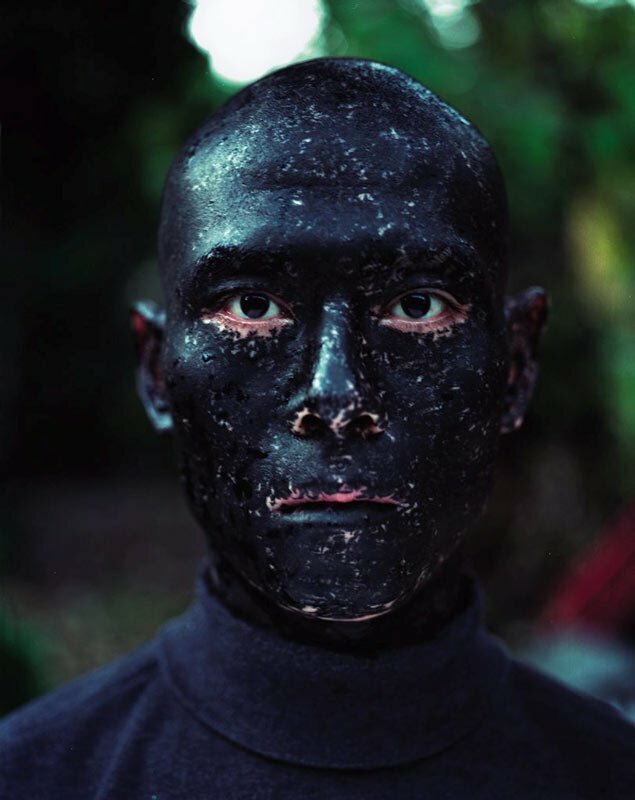 How is their approach different to Zhang Huan’s? How do you feel as you look at this series of photographs? 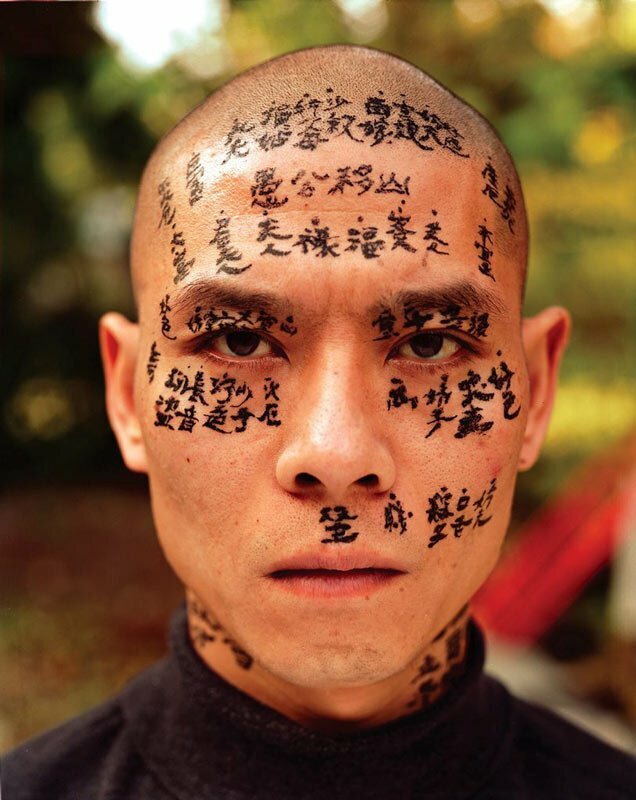 They were taken over the course of a day and show the artist Zhang Huan having Chinese writing or calligraphy painted onto his face. 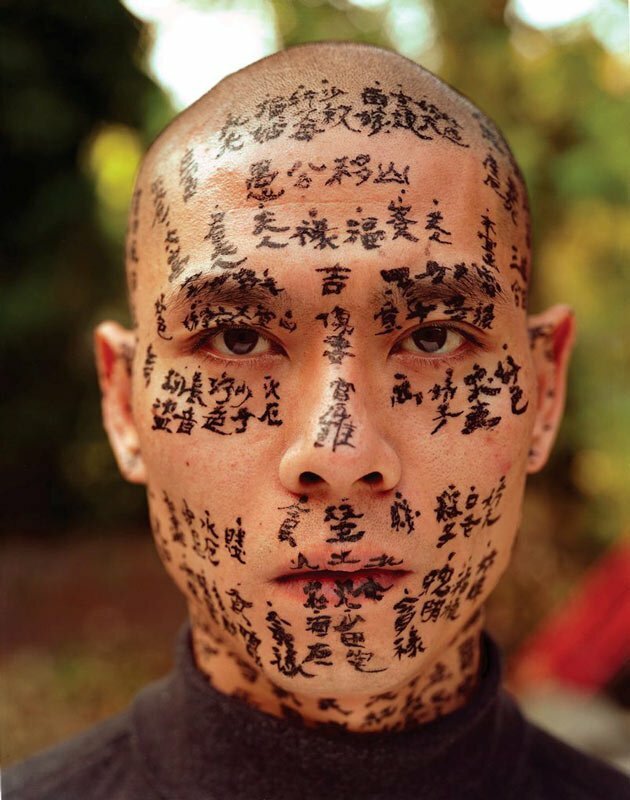 More and more calligraphy covers his features until he becomes fully concealed. 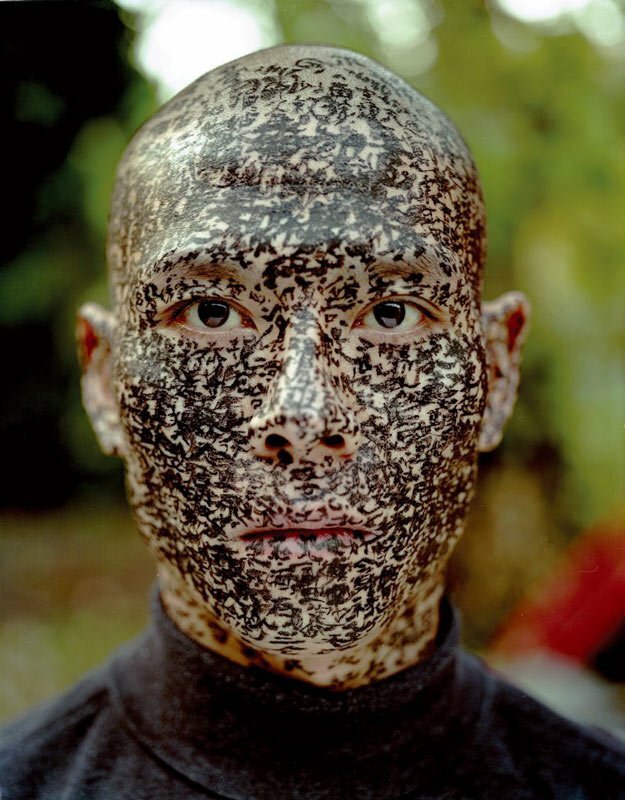 By the last photograph only Zhang’s eyes stand out against his ink-covered skin. 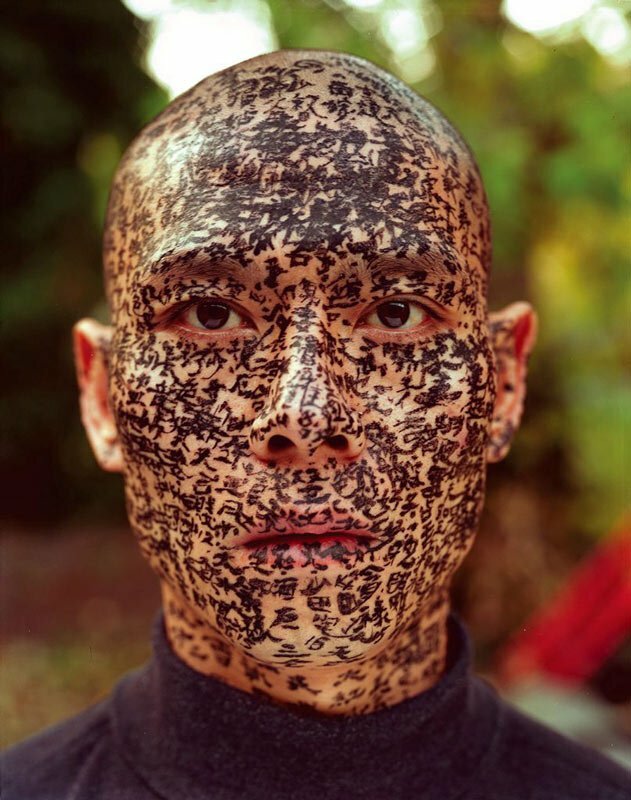 If you only saw the last photograph, could you tell anything about Zhang Huan and what he might be like? Describe your first impression of the work. Does your opinion change after finding out that it is made of Ikea cardboard and shelves? Why use these products? What connotations are associated with them? Can you recognise what these artworks are made of? 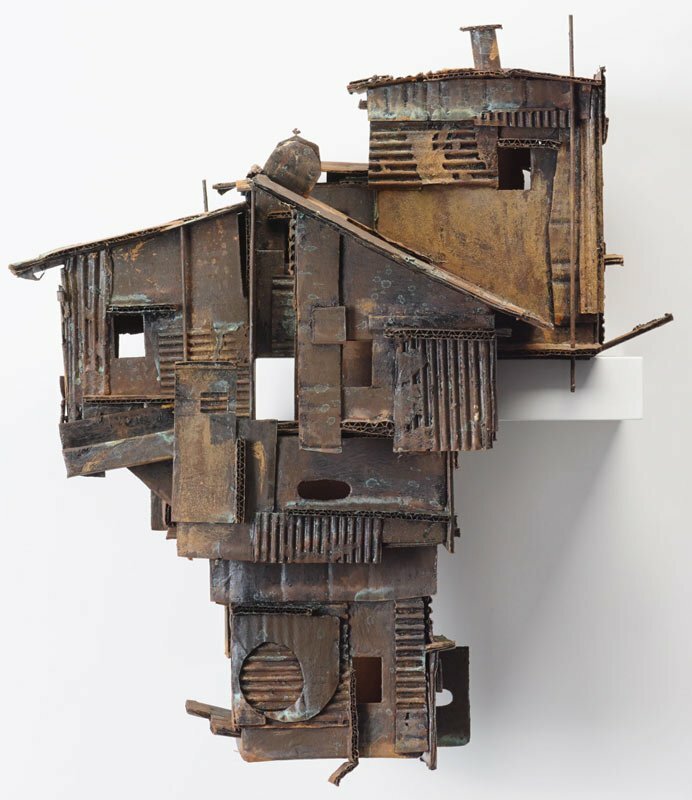 Alfredo and Isabel Aquilizan have used cut-up cardboard boxes to make houselike structures that perch on the edge of shelves. They are like the makeshift shelters that homeless people might make using whatever materials they can find. These buildings remind us of the different living conditions people face in the world and how lucky many of us are. What signs of modern technology can you see on these houses? Each component of this work indexes political, historical and religious themes that comment on the state of Tibetan culture today. 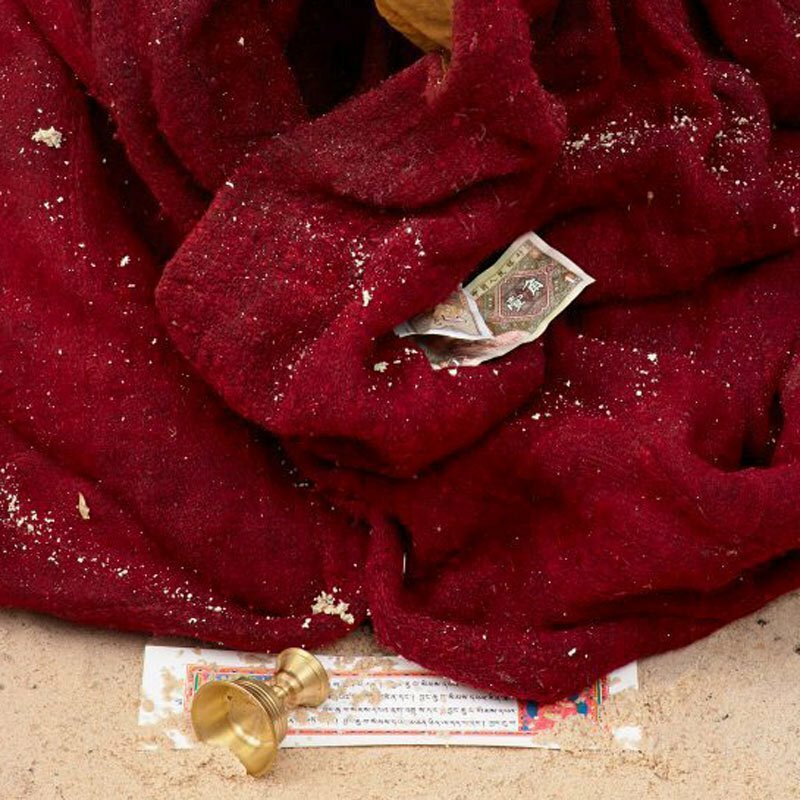 The charred empty robes recall incense and the ritual aspects of Tibetan Buddhism. They might also allude to the horrific spate of Tibetan self-immolations that have claimed more than 130 lives since 2009. The presence of Chinese currency speaks both to the dominance of Chinese culture in Tibet and the commodification of religion, while the overturned butter lamps highlight the disruption of traditional spiritual practices. Nortse is part of a generation of Tibetan contemporary artists who navigate a path between traditional art made in the service of religion and a yearning to represent the current political situation and the disappearance of their cultural identity. Discuss Nortse’s use of symbolism and its connection to his material practice. What is the impact of using found objects? Create a work of your own using a similar approach that reflects an issue important to you. Have you ever sat in deep thought meditating? This artwork by Tibetan artist Nortse looks like a row of meditating monks cloaked in red robes. Upon closer inspection, we can see the robes are empty and covered in ash, giving them the spooky feeling that the monks have disappeared. Perhaps this artwork is a comment on how Tibetan culture has been lost over time. What do you think? While walking the streets of Paris, photographing whatever his eye might find, Eko Nugroho was intrigued by the streetscapes that lay just beyond the main boulevards. He captured the posters, street signs, political slogans and graffiti art that covered the city walls. 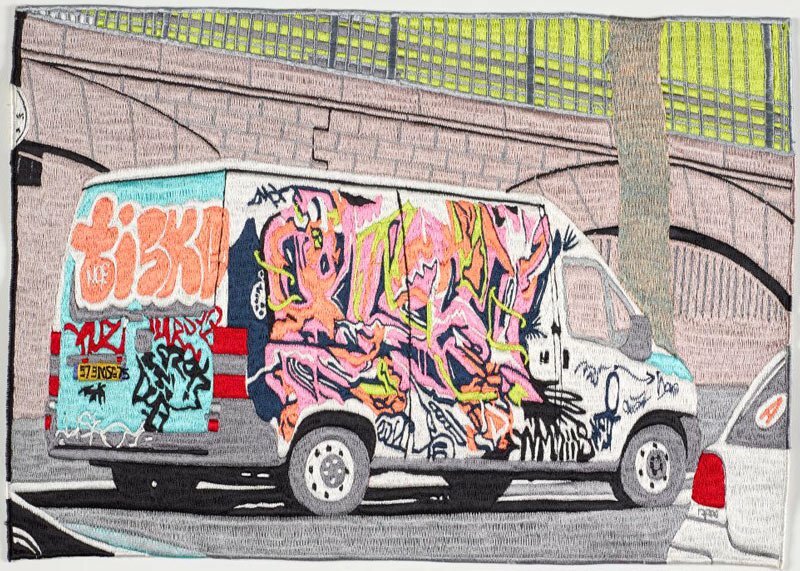 He later transformed these photographs into colourful embroidered vignettes, representing fragmentary memories of his interaction with the city and its people. 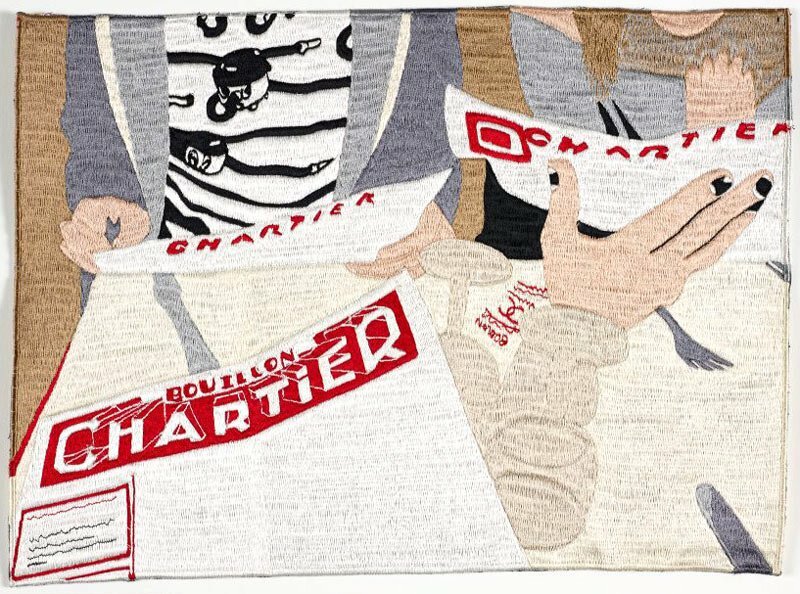 This series of moments, brought together as a wall of embroideries in La Rue Parle #7 (streets that talk), reminds us of the flâneur – the idle wanderer popularised by French literature who defined the modern infatuation with city life. Such a preoccupation dates to the 19th century when many artists turned their focus to the urban milieu. Nugroho similarly documents the changing face of Paris and his own meanderings through its labyrinthine lanes. At first look, do you associate this work with Paris? Why or why not? Discuss Eko Nugroho’s conceptual and material practice. Consider, in particular, why he might have chosen these particular scenes, and why he used embroidery. Have you ever walked through the city and noticed street signs, graffiti or unusual things? Indonesian artist Eko Nugroho was inspired by photographs he took while walking the streets of Paris. 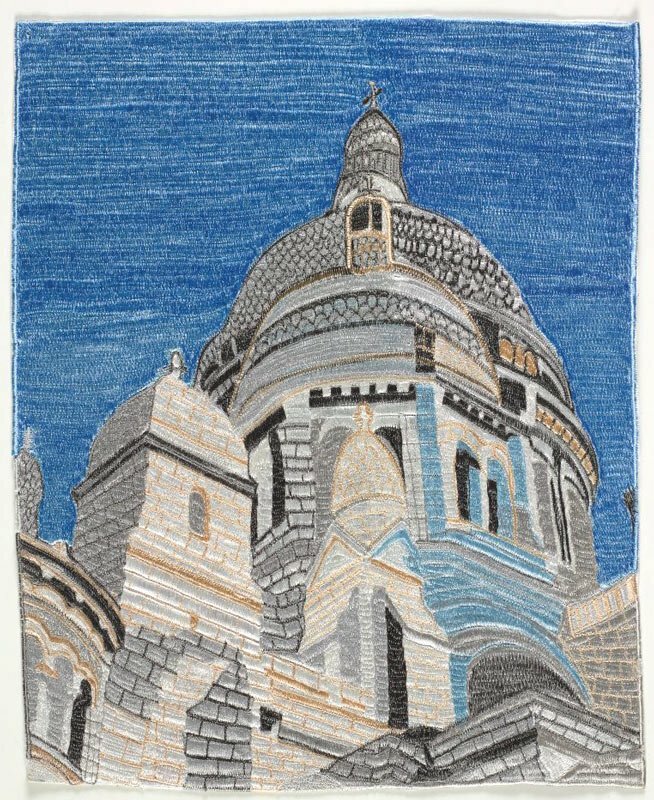 He turned the images into colourful embroideries as a way of remembering his trip. These embroideries were made on a sewing machine with hundreds of tiny stitches in different coloured threads. The name of the artwork means ‘streets that talk’. What could these streets be saying to you? Navin Rawanchaikul’s work asks questions about cultural identity and belonging. This is in part due to his position within Thai society. As a person of Indian parentage he is frequently referred to as a khaek or guest and this insider/outsider position has led him to create extravagant fictional worlds. There is no voice (3) was made in collaboration with Rawanchaikul’s community in Chiang Mai. The work turns a collection of discarded medicine bottles into receptacles for photographs of Chiang Mai’s senior citizens. 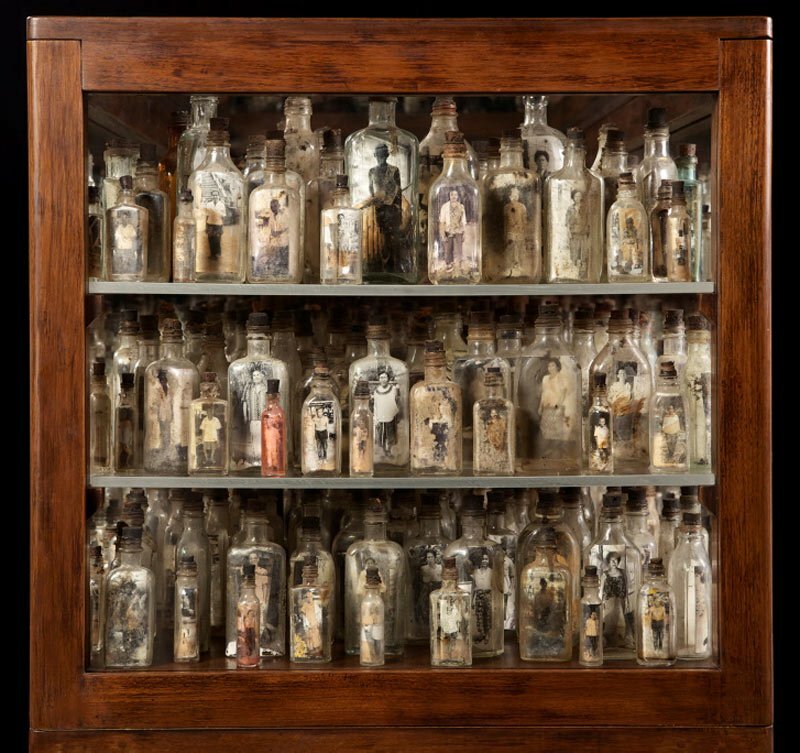 The bottles, with their scratched and blemished surfaces, are clearly analogous with the aged bodies contained within them. Scales moulded into the side of some bottles also become a metaphor for the passing of time and the expiration of life. Describe the visual language Navin Rawanchaikul uses in this work. What is he trying to communicate? Consider the title of the work, the arrangement and materials. How do these elements add meaning? What do these bottles in the cabinet remind you of? 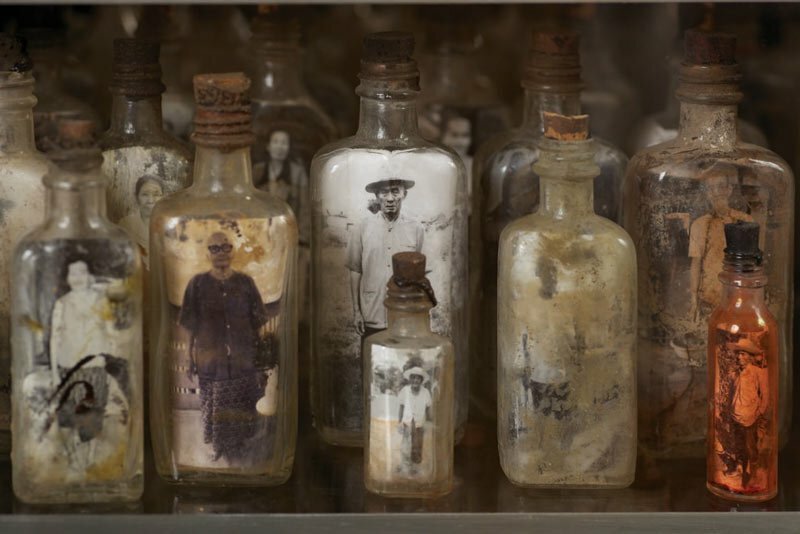 In this work, each old medicine bottle contains a photograph of an elderly person from Chiang Mai in Thailand. Chiang Mai is the artist’s home-town. The people are displayed as if they are scientific specimens. The scratched surfaces of the bottles and the faded images within them suggest the passing of time, reminding us that old age comes to us all. How many bottles do you think are encased within this artwork? This work has been placed across two long walls in the entrance court of the Art Gallery of NSW, a major public thoroughfare for visitors. How do you think visitors will connect with this work? What impact to do you think its physical placement will have on them? Discuss how curatorial decisions impact on meaning of artworks. Discuss the importance of placement and display in enhancing meaning. Jitish Kallat describes this work as 'site catalysed’ because it can move between sites and is determined by the shape, structure and form of the space it is displayed. How is this different to 'site specific’? In what way does this impact on how museums make decisions about display? The bone-like letters in Public notice 2 seem like relics or fossils left on a shelf. How does this play an important role in our interpretation of the work? Research Kallat’s Public notice and Public notice 3 . What elements bind these with Public notice 2 as a body of work? In what ways is each unique? Read Gandhi’s 1930 speech, which forms the basis of Public notice 2 . Does it still have significance today? Has its value changed over time? Has society transformed or are we still struggling with the same issues? Can art make a difference to society? Debate these issues in class in reference to Kallat’s body of work. Do you think words and ideas can change how you see the world? 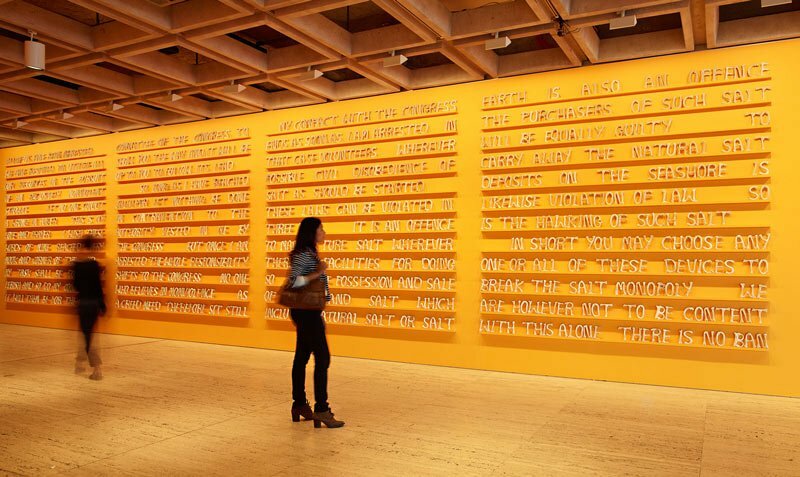 Each bone-like letter of this enormous artwork makes up one of the most famous speeches in history. It was given by Mahatma Gandhi in 1930 before his protest march against British rule in India. Jitish Kallat’s sculpture asks us to remember Gandhi’s courage and his belief in nonviolence. Look at how the artwork is made. 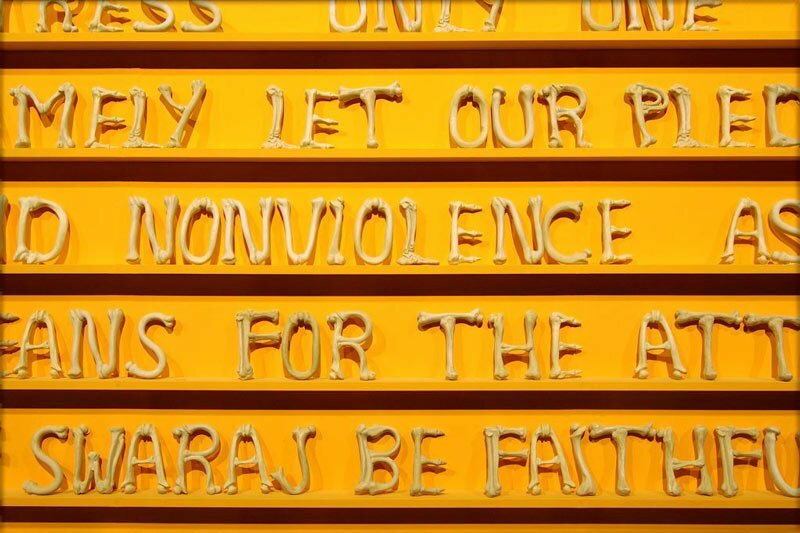 Why do you think the artist has turned Gandhi’s words into bones?